Here’s a summary of how it works and what would change for voters. Rural-urban proportional is a new system created by Fair Vote Canada that attempts to balance the advantages of proportional voting with concerns in many rural communities that electoral reform would diminish their local representation. 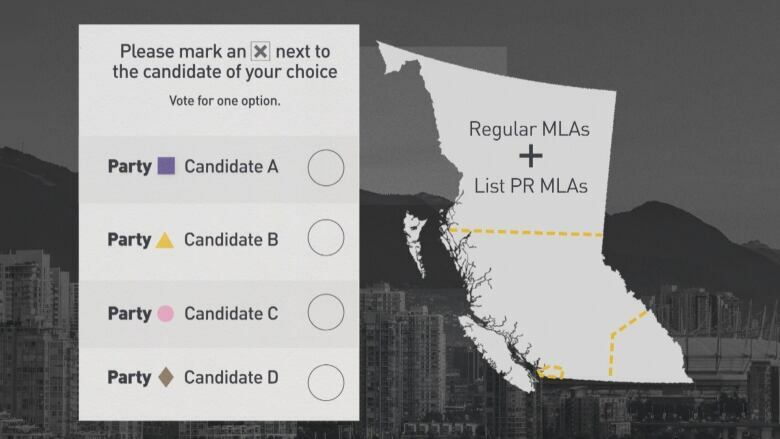 In effect, it would create one voting system for the Lower Mainland and a few other highly-populated areas of B.C., and another voting system for the rest of the province. Here's a summary of how it works and what would change for voters. 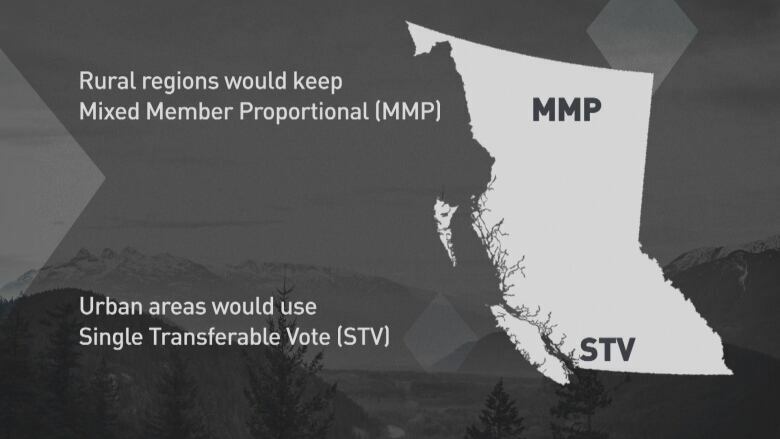 Rural-urban proportional would see the majority of British Columbians choose their MLAs using the single transferable vote (STV) system, while those in rural areas would select MLAs using the mixed member proportional system. In rural areas, people would have a list of candidates in their riding and choose one, same as currently. In urban areas, people would choose between a larger list of candidates comprising their entire region. Anywhere from two to seven MLAs will be elected in these regions, so voters will see multiple candidates from each party on the ballot. They would then rank as many candidates as they would like, from as many parties as they would like. "The big problem with the current system, and it's not solved by some of the other systems, is that people don't have the chance to really express themselves in their vote," said Bruce Hallsor, co-chair of the Yes side in the 2005 and 2009 STV referendums. "They have to think about who's ahead in the polls, who they want to stop, who do they think might have a chance of winning in the riding. Under STV, you just get to vote for who you want to vote for." How would MLAs be determined? In rural areas, the candidate with the most votes in each riding is elected, keeping the current first-past-the-post system (although the ridings will be larger). A small group of secondary rural MLAs would then be picked, so that the number of rural MLAs each party received would be equivalent to the overall percentage of the vote. In urban areas, candidates would have to receive a certain quota of first place votes to be automatically elected. Once they reach that number, the excess votes are transferred to whomever is the second choice on a voter's ballot (or whoever the highest choice is on that ballot who hasn't met the quota yet). 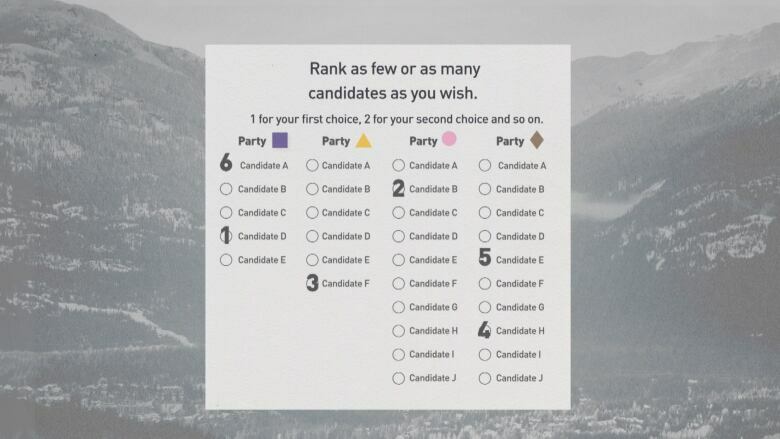 If no candidates reach the quota on the first ballot, the candidate with the least number of first-place votes is eliminated, and people's second choices on those ballots are counted instead. This process would continue until the total number elected matches the number allowed in that urban region. "STV is simple to use. 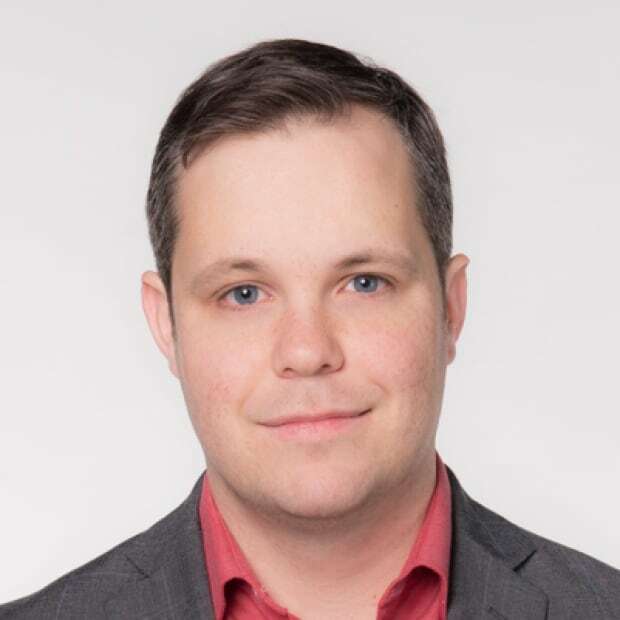 You just go and vote your preference," said Hallsor, who noted that most parties in Canada now use preferential ballots to choose their leaders, including the B.C. Liberals and B.C. NDP. "What it really is designed to do is make sure voters have a lot more choice available than they do in the current single member ridings. By giving people a chance to vote 1-2-3, it allows them to vote for a candidate who maybe doesn't have a chance of winning, and having their second or third choice count, if their first choice is knocked off the ballot." The precise way MLAs are chosen in STV is not directly proportional and involves mathematical theories which can be difficult for the average voters to grasp. Voters in urban areas would have multiple MLAs for their general region, instead of one directly for their specific area. Also, like the other two PR systems under consideration, B.C. would likely have minority governments most of the time, which critics argue would lead to private deals made between parties to determine who holds power and could lead to extremist parties having an outsized influence. Would the size of my riding change? The size of rural ridings would generally increase by 50 to 100 per cent to allow for the MMP MLAs to be chosen. The size of urban ridings would increase by 100 to 600 per cent, because each urban riding would have between two and seven MLAs. Could smaller parties and independents get elected? In the areas classified as rural, smaller parties would need at least five per cent of the vote to qualify for seats but would likely need closer to 10 per cent of the overall vote to actually receive one. In urban areas, an independent or candidate from a smaller party could win one of the seats, if they are broadly popular enough to gain 2nd, 3rd or 4th place votes on enough people's ballots. What would be determined after the referendum? Like the other two systems on the ballot, an all-party legislative committee would decide the total number of MLAs, with a maximum of 95 in total. An independent electoral boundaries commission would then have to create the province's new electoral map. It would also have to decide which areas of the province will use MMP and which areas will use STV. 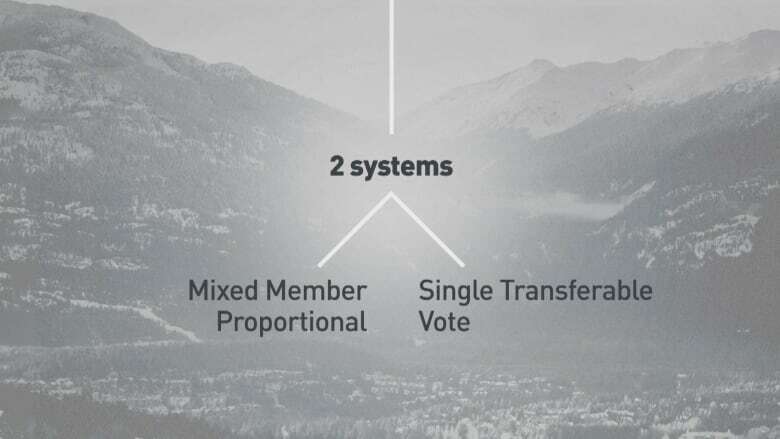 In rural areas using MMP, the all-party committee would have to decide whether people will vote once (for individual candidates) or twice (once for individual candidates, and once for specific parties to decide the second layer of MLAs). CBC Vancouver will have special coverage of the debate between B.C. 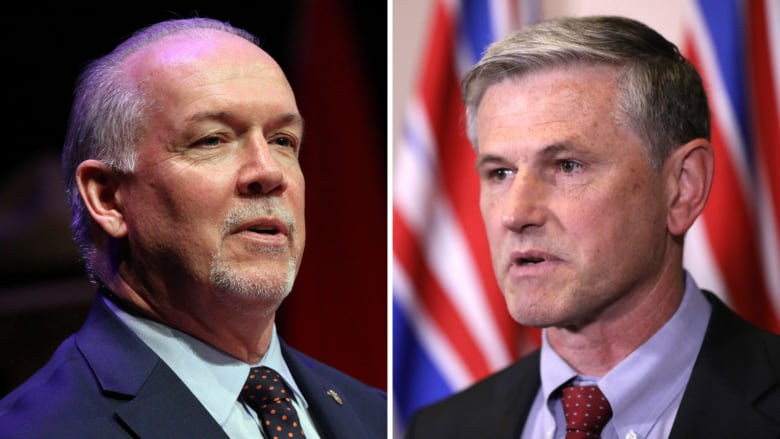 Premier John Horgan and Opposition Leader Andrew Wilkinson on Thursday, Nov. 8, starting at 6:30 p.m. PT on CBC Television, CBC Radio One, CBC British Columbia's website, CBC Vancouver's Facebook page, and @CBCNewsBC Periscope.